Diversified Queensland property group Citimark has offloaded its prominent Festival Towers retail asset for $22.7 million, in one of the largest retail deals to occur in the Brisbane CBD over the past two years. The purchaser, Festival Towers Retail Pty Ltd, is a trust managed by Brisbane-based Asset and Investment Management firm, Marquette Properties. The unitholders in the trust are off shore private equity entities who acquired the property in an off market transaction. Citimark has matured the asset having purchased it as a vacant ground floor lot from developer Devine Ltd in April 2004 for $7.8 million (ex gst) and transformed the property into a popular retail precinct with a mix of local and national tenants. The property is located on a prime site on the corner of Albert and Charlotte Streets in the heart of Brisbane’s premier retail precinct and consists of 1,169sq m of lettable area. The site predominantly fronts Albert Street which is currently undergoing a major rejuvenation organically and with the assistance of Brisbane City Council and is near the Myer Centre, Queen Street Mall and close to the future Queens Wharf and proposed Cross River Rail. Citimark managing director Robert Pullar said the site’s strategic location, size and anchor tenants were major drivers behind the sale. 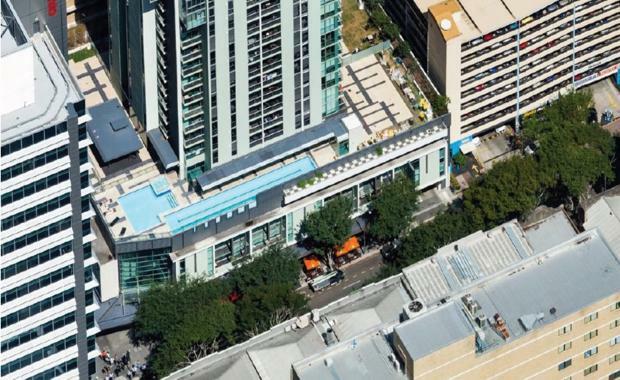 “Brisbane CBD retail properties are tightly held and highly sought after investments, particularly a site like this in such a key growth precinct in Brisbane,” Mr Pullar said. “This sale reflects the confidence and strength of the CBD with the property strategically located on Albert Street and near the future Queens Wharf and Cross River Rail. "Agents acting for Citimark were Mark Greer of MG Property Investments and Andrew Adnam of CBRE. Mark Greer said, “It is rare to find such a large retail asset in the heart of Brisbane’s CBD – the quality of the six anchor tenants was a major drawcard for the buyer. “There’s real opportunity to further subdivide the retail component to facilitate the sale of the individual tenancies as currently leased,” Mr Greer said. Managing Director of Marquette Properties Toby Lewis said this is the third deal the company had originated in the last month. “We have recently acquired three quality retail properties in St Lucia, Central Brisbane and Bushland Beach Plaza in Townsville, and now Festival Towers,” Mr Lewis said. “As a leading asset manager, Marquette Properties is well versed in identifying good value and strategic investments. This asset suited our off-shore investors and is reflective of the fundamentals institutional CBD retail assets found in major Asian cities,” Mr Lewis said. The retail component of Festival Towers adjoins 34 levels of mix-used residential and hotel accommodation as well as four levels of basement car parking which was completed in August 2006. The net passing income for the property as of January 2016 was $1.352 million.